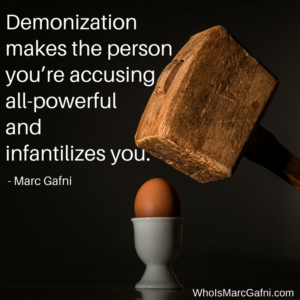 Marc Gafni on The Hidden Payoff to Demonization - Who Is Marc Gafni? What are the hidden motives and gains to be had in demonizing a person? An intense demonization would begin to take place, and the demonizations built on each other until you could have dozens of stories which are all little moments that got distorted, twisted, and then people say, “Oh my god, there’s dozens of stories, it must be true.” It’s not. 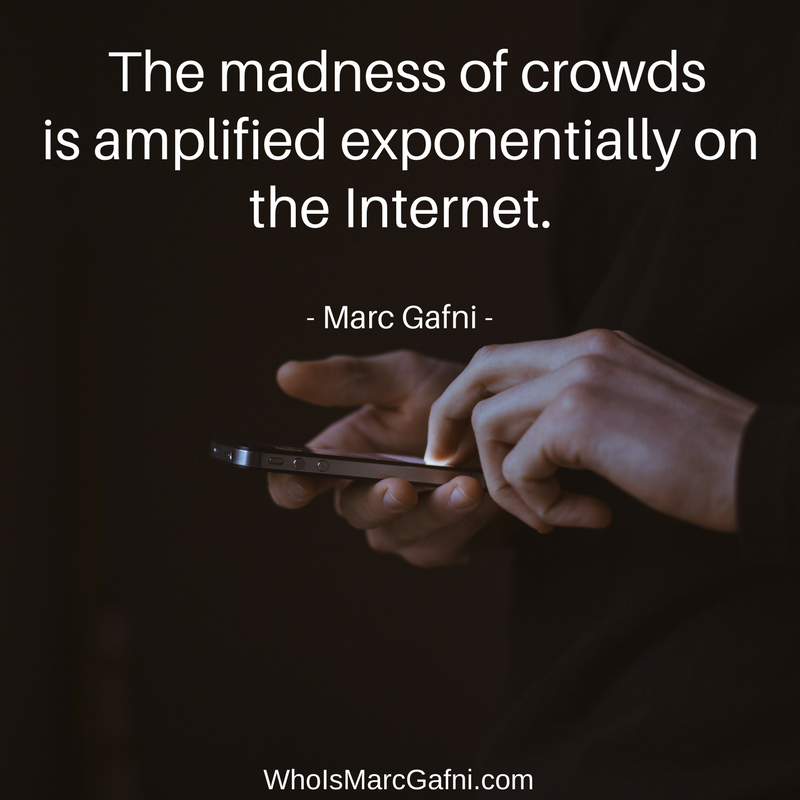 It’s a kind of process of the madness of crowds. 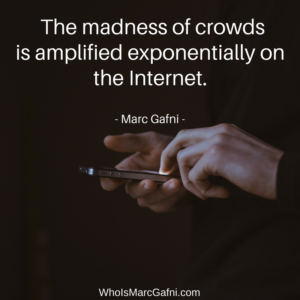 Now, the madness of crowds is amplified exponentially on the Internet. It’s not Salem. It’s the Internet where hate trolling, madness of crowds, ulterior agendas, collusion between parties, those are all hidden. One, you demonize the person who you’re making false complaints against to make sure no one will talk to them. And if no one will talk to them then no one will actually be able to check the evidence that he or she might have which shows that you made false complaints. That’s the first major reason. Second major reason, if you demonize the person sufficiently you can get up in the morning and look in the mirror better, because, okay, the complaints might have been false, but they’re such a bad person anyways, who really cares? Reason two. Reason three, you demonize a person because by ascribing to them demonic powers, they’re a witch, they have occult powers—part of the demonization campaign that I suffered, and it was brutal, was the amount of times it was written on the Web: he has occult powers, he has dark powers, he has demonic powers—what that does is it makes the person you’re accusing all-powerful and infantilizes you. And only if you’re powerless and they’re powerful can you then be a victim accusing them of being a perpetrator. But if you’re both powerful then there’s mutuality, then there’s responsibility. 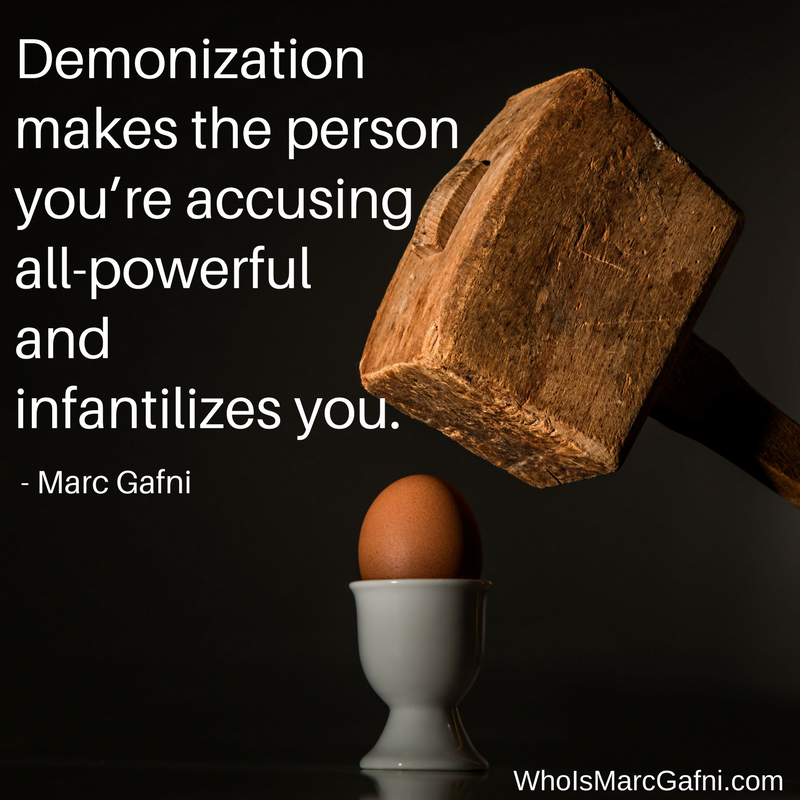 So self-infantilization takes place through demonizing the other person. Those are the three core reasons that we deploy demonization as a strategy in a false complaint story.